As Michelangelo Matos referenced in his review for CityPages in 1999, “Ronald Thomas Clontle doesn’t bother trying to persuade you that his opinions aren’t wrong–he doesn’t even try to convince you he knows what he’s talking about.” Clontle describes himself not as a critic, but “a compiler of opinions”, although at a slim 98 pages, this $25 (!) glorified pamphlet seems to reflect as much of his own views as the public at large. Due to my wife’s past residence in the land of Rock Chalk Jayhawk, we’ve made a few trips to the Hutt, and I’ll admit that said milieu is fairly knowledgeable about music, although their recent addition of a refill charge makes me question the “bottomless” part of the Bottomless Wookiee (props to the Hutt for carrying most of the Hippy Johnny line of organic cauldron scrubbers, though). Caller: You call this ‘The Ultimate Argument Settler’, well I think it causes arguments. Clontle: (Emphatically) Well I disagree…100%! 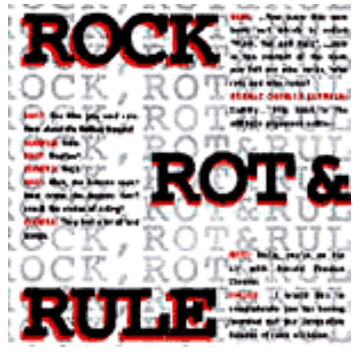 Rock, Rot and Rule’s significance will grow, due to its status as one of the final “from on high” publications before the internet allowed listeners to find and assess virtually any song ever written. This snapshot of a pre-Napster, pre-WinMX era served as a buying guide for parents seeking a CD for their emotionally-distant child (although Clontle was more of a cassette guy). While there is little in the way of written narrative, Rock, Rot & Rule includes at least eight photos, a brief introduction, and an acknowledgement of the forgotten-but-awesome movie Roadie, featuring Meat Loaf, Blondie, Roy Orbison and Alice Cooper (serving to reinforce my theory that any film from the late 1970’s-early 1980s featuring a hand-drawn caricature on the poster will never disappoint). I’d say that this book rules. I love that he’s rated both Zeppelins. I adore Madness…but “they started ska?” Seriously? That sound was around a good twenty five years before Madness so fantastically resurrected it. Sounds a bit like this guy relegated his list to only things which existed in his own musical universe. Saying stuff Rocks, when other people think it Rots, totally Rules. Boring music criticism is the worst, but this stuff is the Wurster. Doesn’t it defeat the purpose of compiling a list of what your friends think about music if your friends don’t know any more about what they’re talking about than you do? This costume is sure to make your dog the cutest thing of the night. oil or water based sticks, similar to a lipstick. been seen on shows such as “Strictly Come Dancing”, “Dancing on Ice”, “The Royal Variety Performance”, “So you think you can Dance”, and “Britain. Two similar wolf track shapes with pointed toes have to be cut. Adults are as looking forward to their attire as their minor counterparts. allowed to visit in their favorite Halloween costumes. Don’t forget sci-fi heroes who have a little saber in one hand and a Halloween bucket in the other, just make him wear a star wars outfit. young kids rooms. It is ideal if you look for larger wallpaper sheets instead of smaller strips that put substantial focus on borders. Distressed woods, rich colors, and leather detailing can create a rustic look. Perhaps saving all your money for the things you need and spending the money you might have left over for the things you want. it is possible to perhaps borrow the items you need that won’t last longer. the whole look of your residence.